It feels like it’s been way more than five years since Adebayo Oke-Lawal left his styling collective BUBAAI (short for Bubu, Bayo and Aisha) to start his own design label Orange Culture. He was 21 then and a Unilag alumni and fashion design as a career was only starting to gain traction in Nigeria. Even by that point Oke-Lawal already had an impressive resume, with styling work on some of the biggest fashion magazines at the time and network that spanned the entire continent. When he decided, after a year of dabbling in women’s wear collections that he was going to focus exclusively on menswear, it seemed at first a misstep. Women’s wear in Nigeria has established retail channels, and extensive PR network and a large clientbase. 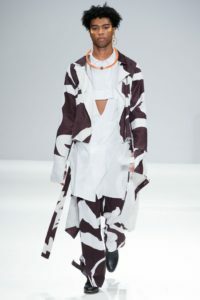 But his first collection, which featured an abstract print pleated kilt was released, followed by an opportunity to showcase at the inaugural Lagos Fashion and Design Week as part of the showcase’s first class of emerging designers showed Oke-Lawal was thinking bigger than the conventional. Even then it took him a while to find his voice, there were a number of ‘safe’ collections before Spring 2015’s epochal ‘H.E.R’ collection. 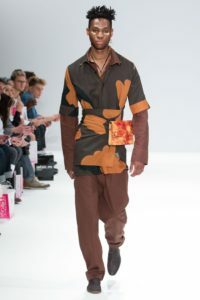 Oke-Lawal completely divested himself of Western influences and introduced the first of a line of bespoke prints for the label celebrating the designer’s Yoruba and Edo heritages. 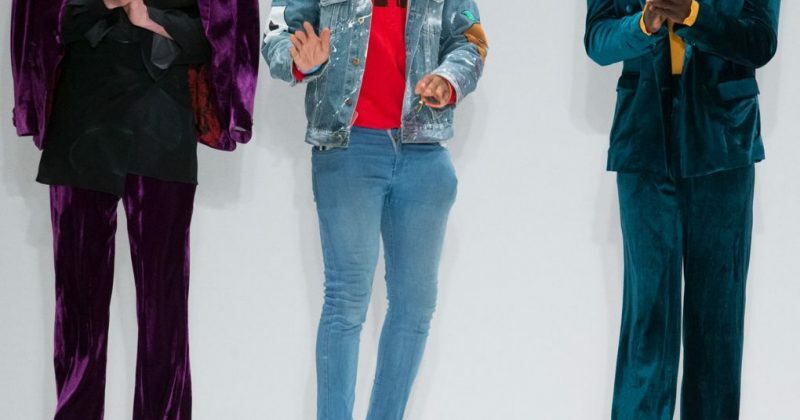 He also began to properly explore androgyny in the collection, effectively blurring the line between mens and women’s wear and opening his line once again to his long time female fanbase. 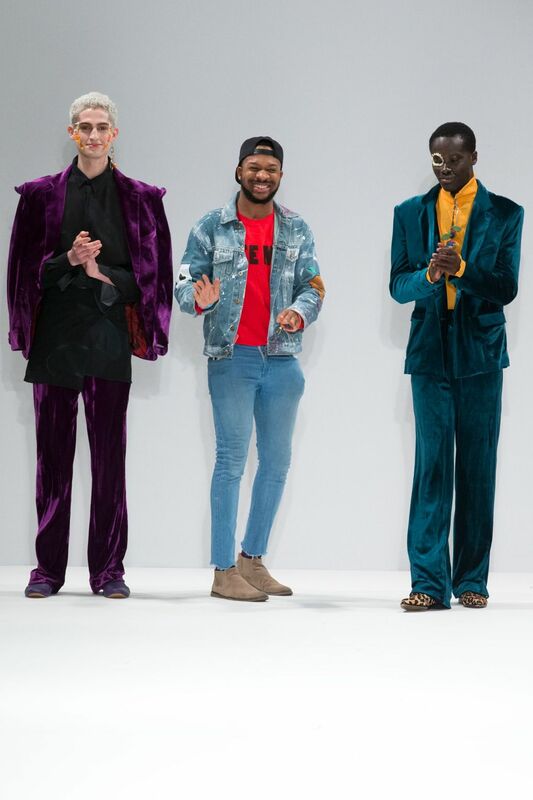 Following ‘H.E.R’, Oke-Lawal was invited to join the first team of designers to represent Nigeria at the International Fashion Showcase, and with the help of curator Yegwa Ukpo winning the country’s first honors at the showcase. 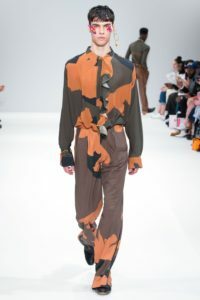 On the heels of this came invitations to show the South Africa Menswear Week, at Pitti Uomo, the world’s most prestigious fashion trade show and invitation to host a presentation at the 2016 London Collections: Men. Considering how unconventional Oke-Lawal’s designs and inspirations are, it was the biggest possible recognition of his work. That was, until he was invited to officially debut his Autumn 17 collection as part of the London Fashion Week’s fall schedule. For this, Oke-Lawal revisited his archives and made a pastiche of all the trends that have defined the brand. 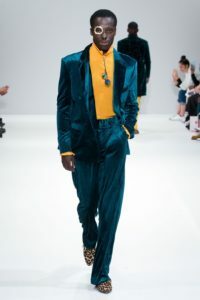 Androgyny, Streetwear, athleisure, velour and femininity all spliced into a collage of what it means to be a Nigerian menswear designer defining for himself what the boundaries of Nigerian fashion are. 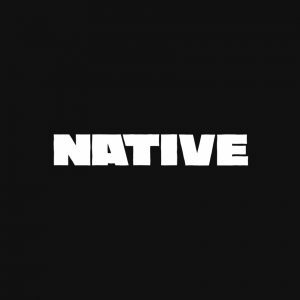 Oke-Lawal becomes the first and the second youngest (after Osakwe of Maki-Oh) to organically rise through the ranks and demand international attention and the respect of the world’s most important critics. It definitely is a win for Nigerian design and Nigerian menswear.